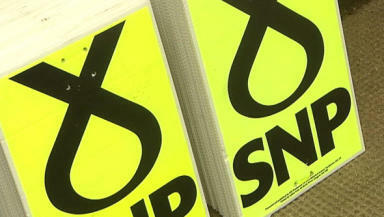 Councillor David Berry, from East Lothian Council, has resigned from the SNP over a Twitter row. A councillor has resigned from the SNP amid a row over a tweet that referenced slavery. Councillor David Berry, who is the representative of the North Berwick Coastal ward at East Lothian Council, has withdrawn from the local branch of the party. He will remain on the council as an independent but will have no further relationship with the SNP following a comment comparing the Union to slavery and using the term "Massah". Mr Berry tweeted the official Better Together Twitter account last Thursday after the pro-Union campaign tweeted about a "new leaflet which has Scots saying why they think we are stronger in the UK". In response, Mr Berry wrote: "Do you have equivalent quotes from abused women saying why they don't need a divorce or slaves happy on the plantation, Massah?" On Saturday, the councillor wrote a blog post about the episode entitled "Mea Culpa". He said: "It was only when the responses came pouring in that I realised the extent to which I had aroused indignation and had wholly misjudged how such statements would be taken." After receiving critical responses to his tweet, he posted on Twitter: "In view of strong response, my original comments seem excessive. I withdraw them and apologise if I caused offence." He stated in a blog post that he was taking the weekend to review his options. Mr Berry added: "The party was swift to (rightly) distance themselves from my original statement and I have had no pressure from them since to take any particular action. Nonetheless, I will be considering what, if any, action on my part now would constitute the most appropriate way of making amends." An SNP spokesman said: "This was a personal decision by Councillor Berry, he withdrew his comments last week and apologised, and the SNP regarded the matter as closed. "He is an effective councillor for his community, we thank him for his contribution to the party and wish him well."